Throughout the Civil War, Confederate armies used the Shenandoah Valley as a natural corridor to invade or threaten invasion of the North. 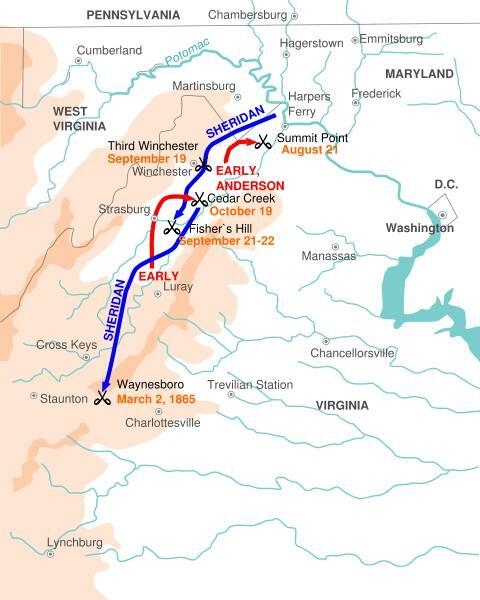 Because of its southwest-northeast orientation, Confederate armies marching down the Valley approached Washington and Baltimore, while Union armies marching up the Valley moved farther away from Richmond. The Blue Ridge served as a natural screen for the movement of troops. By defending the gaps with cavalry, Confederate forces could move swiftly north behind the protective wall of the Blue Ridge into Maryland and Pennsylvania, which Gen. Robert E. Lee accomplished during the Gettysburg Campaign in 1863, as well as Jubal Early in 1864. The Blue Ridge offered similar protection to Lee's army during its retreats from Antietam and Gettysburg. When the need arose, Confederate defenders could hold the gaps in reverse against a Union army operating in the Valley. 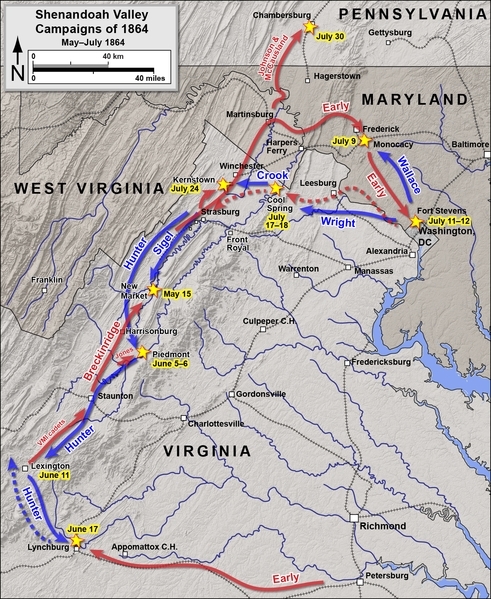 By withdrawing to the Blue Ridge near Brown's Gap to protect Charlottesville and eastern Virginia, the Confederates could threaten the flank and rear of any Union forces intent on penetrating the Upper Valley. 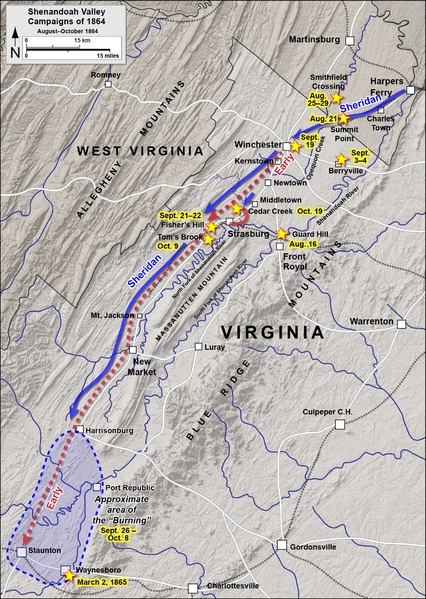 The western gaps in the Allegheny chain were defended by Confederates against sporadic Union feints and incursions from West Virginia. 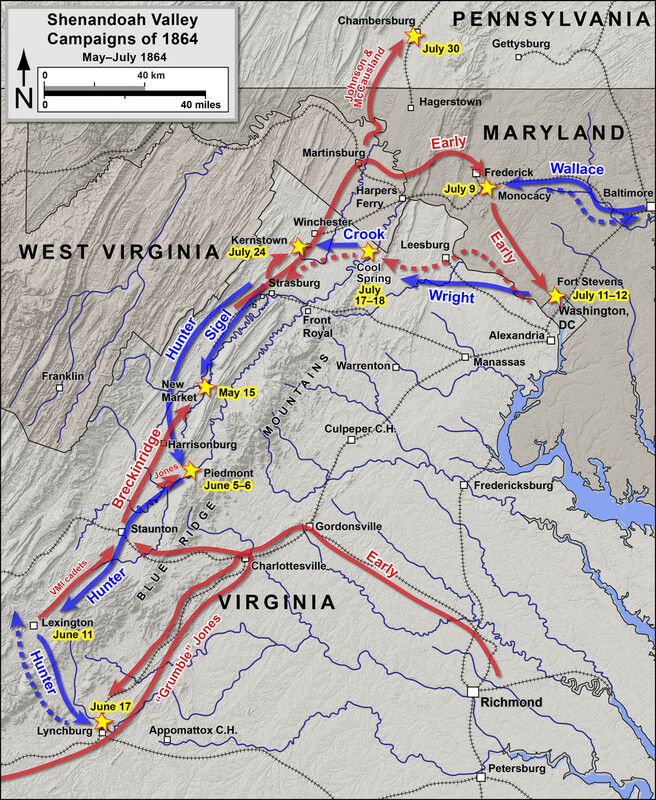 On the whole, Confederate armies succeeded in preventing deep Union penetration of the Upper Valley until late in the war, and Valley geography cooperated with the defense. Where the Massanutten Mountain rises abruptly between Front Royal and Strasburg, the width of the Valley is greatly decreased. With strong infantry at Fisher's Hill in the main valley south of Strasburg and cavalry at Overall (antebellum Milford) in the Luray Valley, a Confederate general could effectively hold the Upper Valley against a numerically superior enemy. Fisher's Hill astride the Valley Turnpike was an important strategic "choke point" throughout the war. 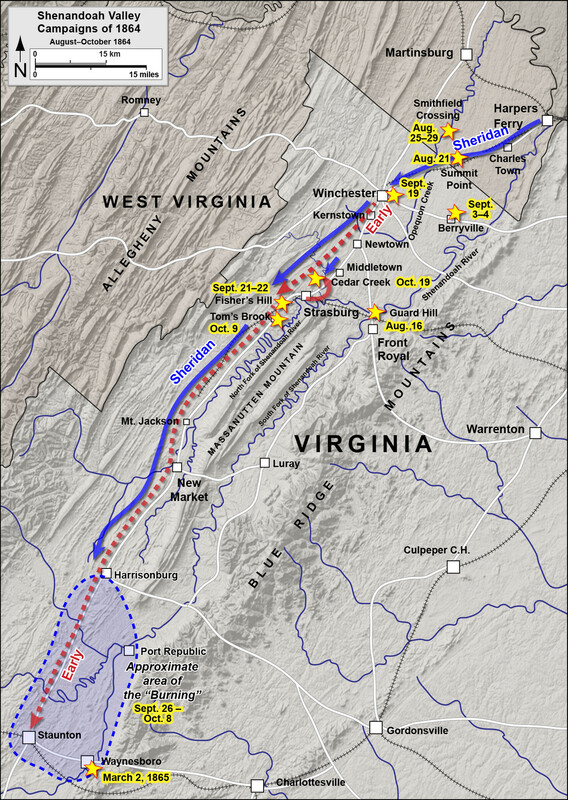 If Confederate generals chose to withdraw up the Valley Turnpike from Fisher's Hill, any pursuing Union general was forced to split his forces at the Massanutten in order to cover an advance up both the main and the Luray valleys. Once divided, he could not again reunite his forces for more than fifty miles because of the intervening mountain. Only a single rough road crossed the Massanutten--running from New Market to Luray through the New Market Gap. Thomas J. "Stonewall" Jackson used Massanutten Mountain to screen his offensive movements in the 1862 Valley Campaign. 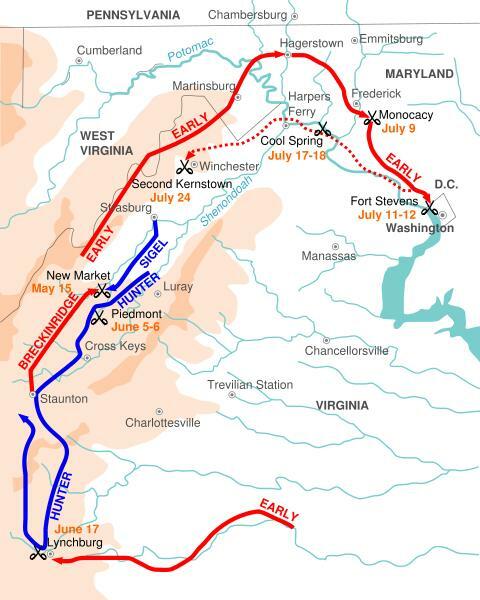 Crossing from New Market to the Luray Valley in May, he advanced on Front Royal and then on Winchester, forcing the Union army, then at Strasburg, into abrupt withdrawal. Later in the campaign, he prevented two Union columns advancing against him up the main and Luray valleys from reuniting and defeated each separately in the climax of his campaign at the battles of Cross Keys and Port Republic. 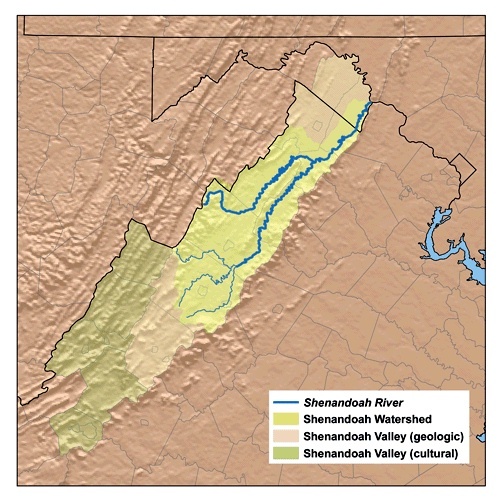 The Shenandoah Valley was referred to as the "Granary of Virginia." It was the richest agricultural region in Virginia, and its abundance supplied the Confederate cause. Because a large number of the inhabitants of Frederick, Shenandoah, Rockingham, and Augusta counties were pacifist Quakers or Dunkers who refused to fight in the war, the Valley continued to produce horses, grains, and livestock even after other portions of Virginia were made barren by the flight of slaves or the enlistment and conscription of the farmers. As the war continued, the City of Richmond and the Army of Northern Virginia, pinned down in the trenches at Richmond and Petersburg, came to depend more heavily on produce shipped from the Valley on the Virginia Central Railroad. Capturing the supply depot of Staunton and severing this railroad became a major objective of the Union armies in 1864. As the war progressed, Lynchburg also became an important objective of Union campaigns in the Valley. In 1864, several expeditions began up the Valley from Winchester, and north from Bulls Gap, Tennessee, with the objective of capturing Lynchburg, but the city remained in Confederate hands until the end of the war. By 1865, battlefield attrition would prove costly for the Confederacy while Union manpower and resources would continue to reinforce its armies in the field. Lt. Gen. Jubal Early resigned after his defeat at the Battle of Waynesboro on March 2, and Lee would surrender to Grant the following month on April 9 at Appomattox Court House. In March 1864, Lt. Gen. Ulysses S. Grant assumed overall command of the Union armies, east and west. In May, he ordered Maj. Gen. Franz Sigel to cooperate with the Army of the Potomac's spring offensive by advancing up the Valley to disrupt Confederate communications at Staunton and Charlottesville. On May 15, while Grant and Lee were locked in desperate combat at Spotsylvania Court House, Sigel made contact with a Confederate force under former vice president of the United States John C. Breckinridge at New Market. Sigel was defeated and retreated rapidly beyond Strasburg, crossing Cedar Creek by dusk on May 16. Grant then replaced Sigel with Maj. Gen. David "Black Dave'' Hunter, who was given the task of cutting the Virginia Central Railroad. From Staunton, Hunter continued south, sporadically destroying mills, barns, and public buildings, and condoning widespread looting by his troops. On June 11, Hunter swept aside a small cavalry force and occupied Lexington, where he burned the Virginia Military Institute and the home of former Virginia Governor John Letcher. Hunter's successes forced Lee to return Breckinridge and to send the Second Corps of the Army of Northern Virginia under Lt. Gen. Jubal A. Early to the defense of Lynchburg. 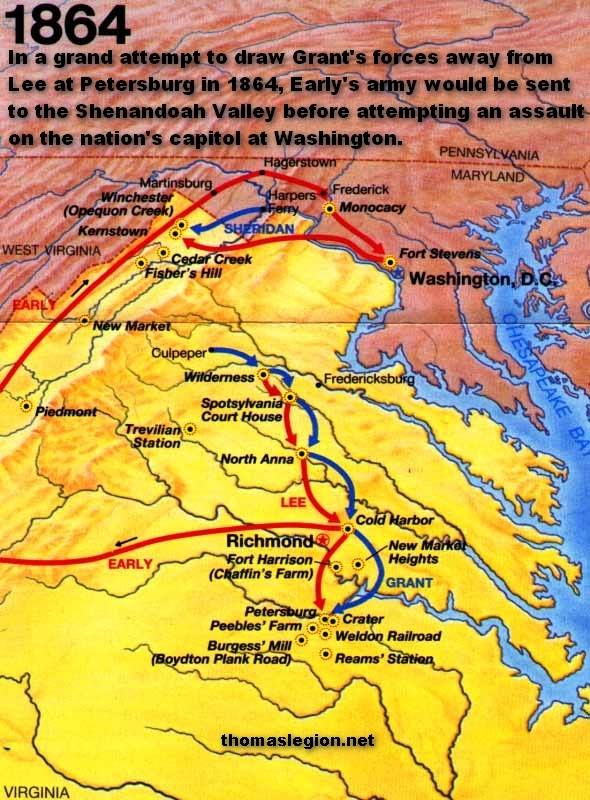 Sending Early to the Valley was a desperate decision that restricted Lee's ability to undertake offensive operations against Grant on the Richmond-Petersburg front (see Siege of Petersburg). Early's Raid and Operations Against the B&O Railroad [June-August 1864], aka Early's Maryland Campaign, comprised the following battles: Monocacy – Fort Stevens – Heaton's Crossroads – Cool Spring – Rutherford's Farm – Kernstown II – Folck's Mill – Moorefield. Early's threat to Washington, Crook's defeat at Second Kernstown, and the burning of Chambersburg, forced Lt. Gen. Ulysses S. Grant move decisively to end the Confederate threat in the lower Shenandoah Valley. Grant returned the VI and XIX Corps to the Valley, reinforced by two divisions of cavalry, and consolidated the various military districts of the region under Maj. Gen. Philip H. Sheridan, who assumed command of the Middle Military District at Harpers Ferry on August 7. Sheridan's Valley Campaign [August-October 1864] witnessed the following battles: Guard Hill – Summit Point – Smithfield Crossing – Berryville – 3rd Winchester – Fisher's Hill – Tom's Brook – Cedar Creek. With the Confederate threat in the Valley eliminated, General Sheridan led his cavalry overland to Petersburg to participate in the final campaign of the war, Richmond-Petersburg Campaign, in Virginia. On April 9, 1865, after collapse of the Petersburg lines and a harried retreat, General Robert E. Lee surrendered the Army of Northern Virginia to General Ulysses S. Grant at Appomattox Court House. Sources: National Park Service; Official Records of the Union and Confederate Armies; Maps by Hal Jespersen located online cwmaps.com.